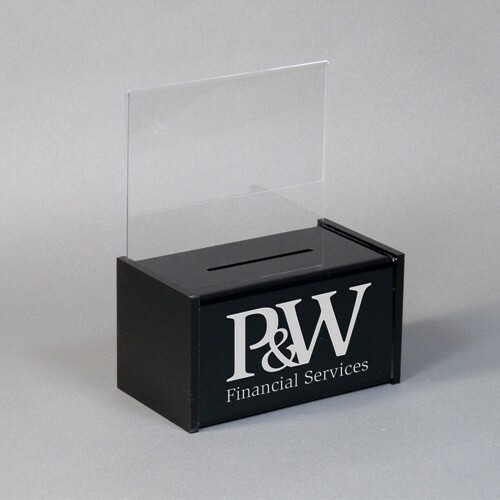 Made from durable acrylic, this entry box comes complete with a clear acrylic front mounted 8.5"x11" sign holder and a brochure pocket. Each entry box also comes with a second 8.5"x11" poster frame mounted on the back side of the box & a key lock to secure the contents. Keys included. Imprinting available for this product. Customize with your logo! • Beautiful oak construction in your choice of finishes. • Sturdy & well built. Made in the USA! • Features an 8.5"w x 11"h sigh holder in the back that locks in place to secure the entry contents. • Includes two key set. 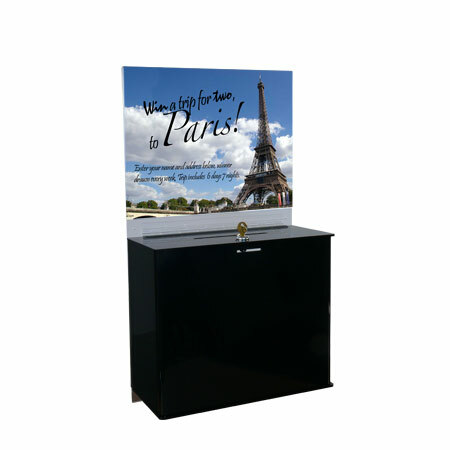 • Includes an 8.5"w x 11"h sign holder and (2) acrylic brochure pockets for 4"w brochures. 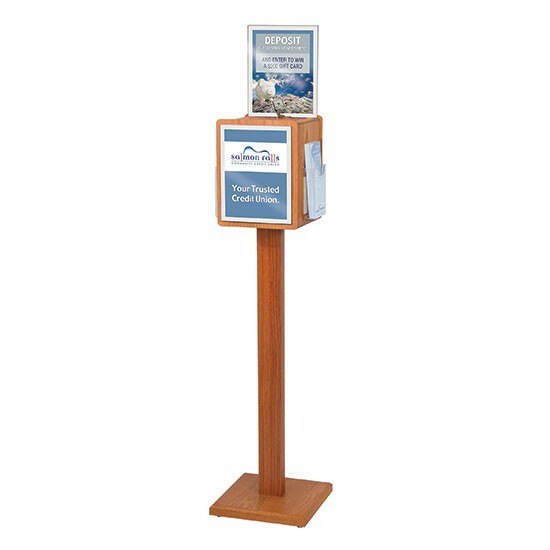 • Shown in golden oak with the add-on sign holder & brochure pockets. 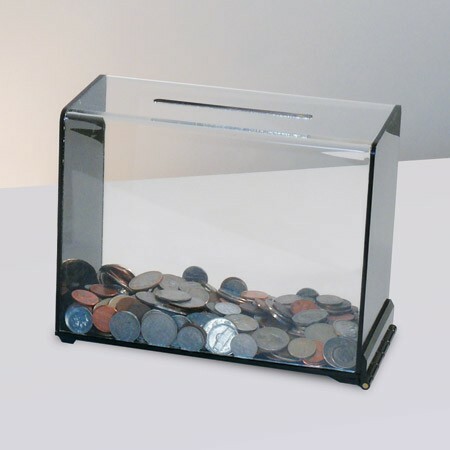 Free Standing durable acrylic, choose counter or floor model. 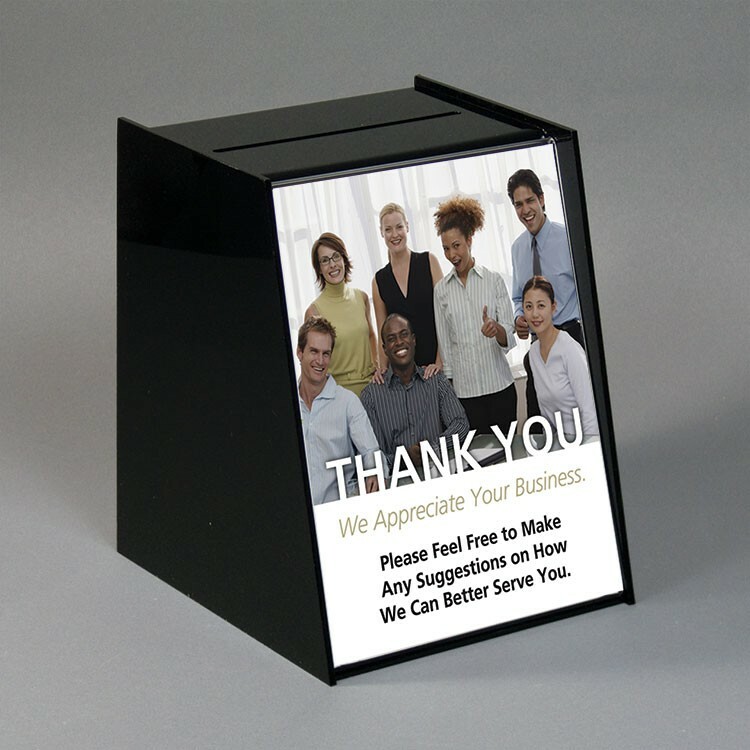 Unit comes complete with 2-key lock, slot for cards, forms, etc.. Includes locking 81/2"x11" back sign holder & separate add-on 81/2"x11" sign holder for the front as well as 2 mountable 4" brochure pockets which can be utilized. 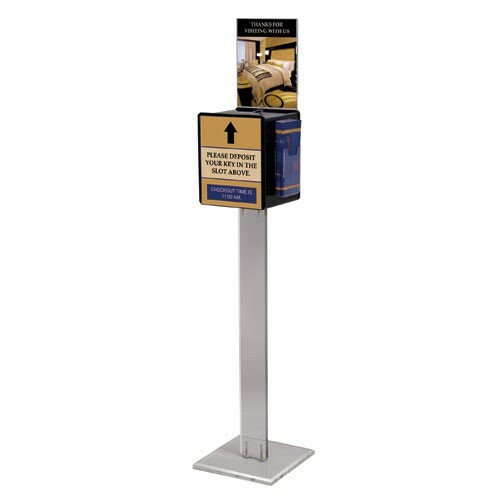 Separate add-on brochure pockets & sign holder attach with double sided adhesive tape. Overall height 571/2. Top slot size 6"w x 1/4"d, 3 1/4" Thick Stand, 1"Thick Base. 4 Bolts, washers & Allen wrench included. This lockable entry box has hinged top covers and key locks for added security. Backs have four holes for mounting into wall. Measures: 14"w x 11-3/4"h x 6-1/2"d Comes complete with header channel & 2 literature dispensers. Wall Mount Bracket for D00751. Comes with mounting hardware. Must order D00751 separately. 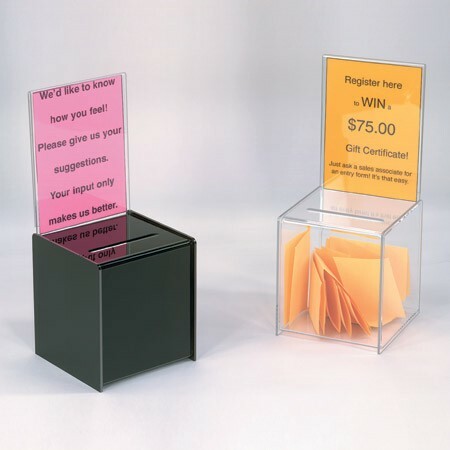 This large, black acrylic registration / suggestion box comes complete with an angled 81/2" x 11" sign area for your serving as the front face. 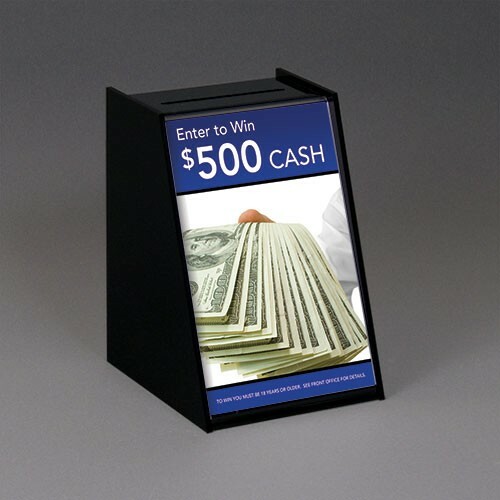 The sign holder functions as a slide-away cover. 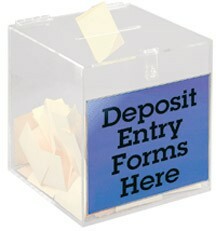 A 7"w x 1/2"d top slot allows for the accumulation of many entries. Mounting pocket available. Optional single brochure pocket (D01960W). 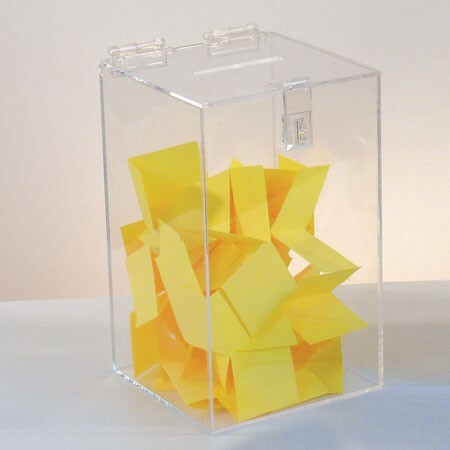 Box dimensions: 9"w x 11-1/4"h x 9-1/4"d.
Large oak ballot box with an angled 8.5"x11" sign area for your insert. 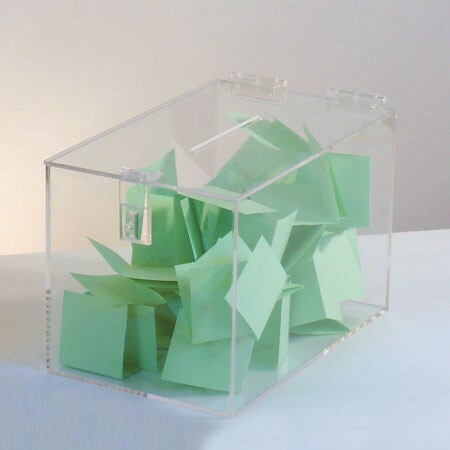 A 7"w x .25"d top slot allows for the accumulation of many entries. 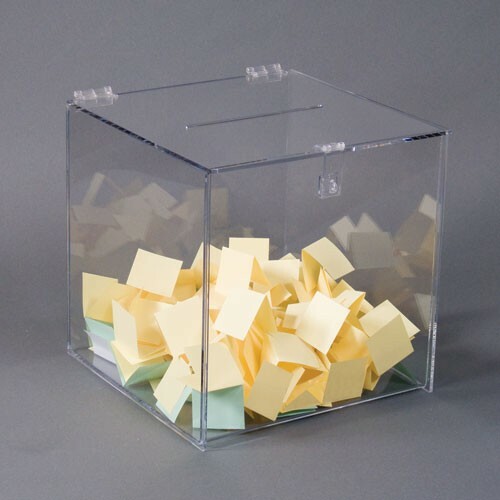 Measures: 8.5"w x 11"h x 9.5"d Optional clear dispenser (D01960W), sold separately. This lockable entry box has hinged top covers and key locks for added security. Backs have four holes for mounting into wall. Comes complete with a header channel & 1 literature dispensers. 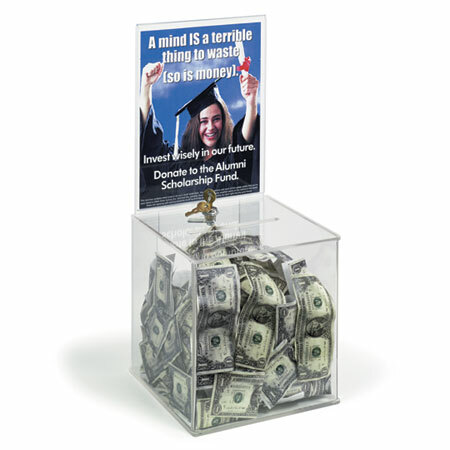 Optional 8.5"w x 11"h clear acrylic channel for your graphic materials. To be used with part# D00755. 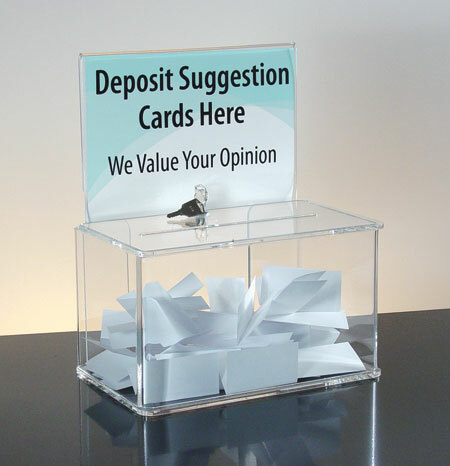 This black acrylic suggestion box is 8-1/2"w x 5"h box with a clear header. Header designed for 8-1/2" x 11" with the top half of page (8-3/4"x 5") as the viewable message area. Custom allen key locking mechanism. 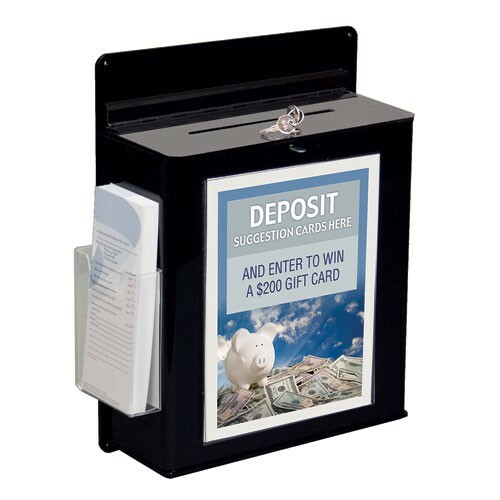 Top slot size 4-1/2"w x 1/4"d, Shown with optional 4"w x 3-1/2"h literature pocket (sold separately - D01961W). You can post this to the wall with the purchase of the D00751M. Imprinting available for this product. Customize with your logo! 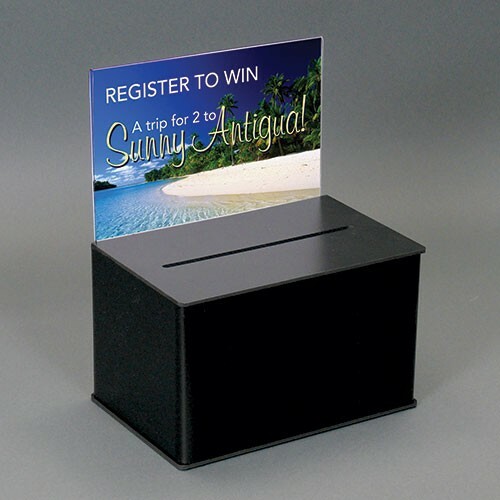 This Acrylic Registration Drop Box is made from black acrylic with clear sign face. 5-1/2"w x 8-1/2"h sign area with a 4"w x 1/2"d slot. Shown with optional clear dispenser (D01961W), sold separately. Imprinting available for this product. Customize with your logo! 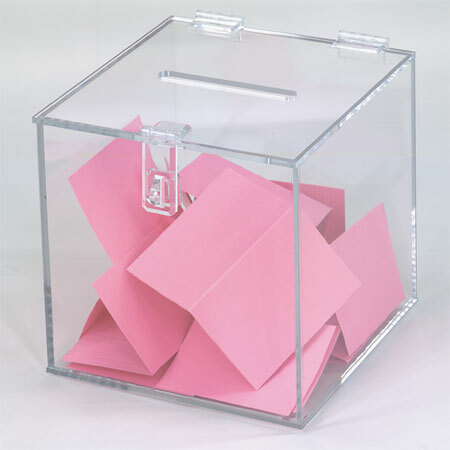 This Ballot/Entry Box with key lock and 8-1/2" x 11" "quick-change" message header. Print your own message, into header, change whenever you like. 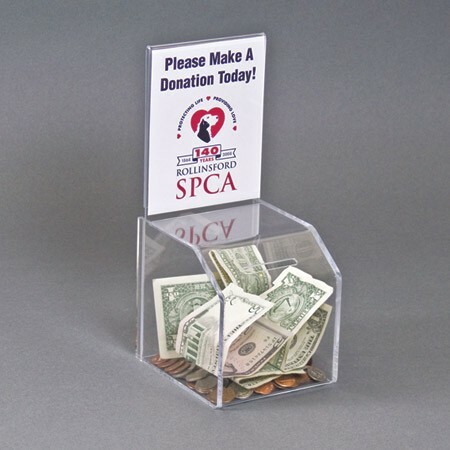 Base box measures 9-1/2"w x 9-1/2"h x 9-1/2"d with 6"w x 1/2"d top entry slot. 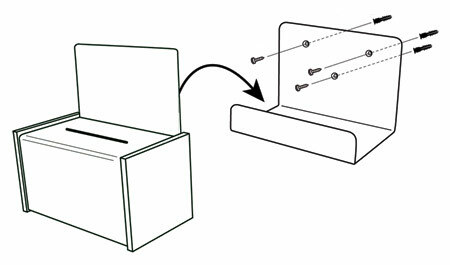 Unlock box and slide off header to empty contents. Imprinting available for this product. Customize with your logo! 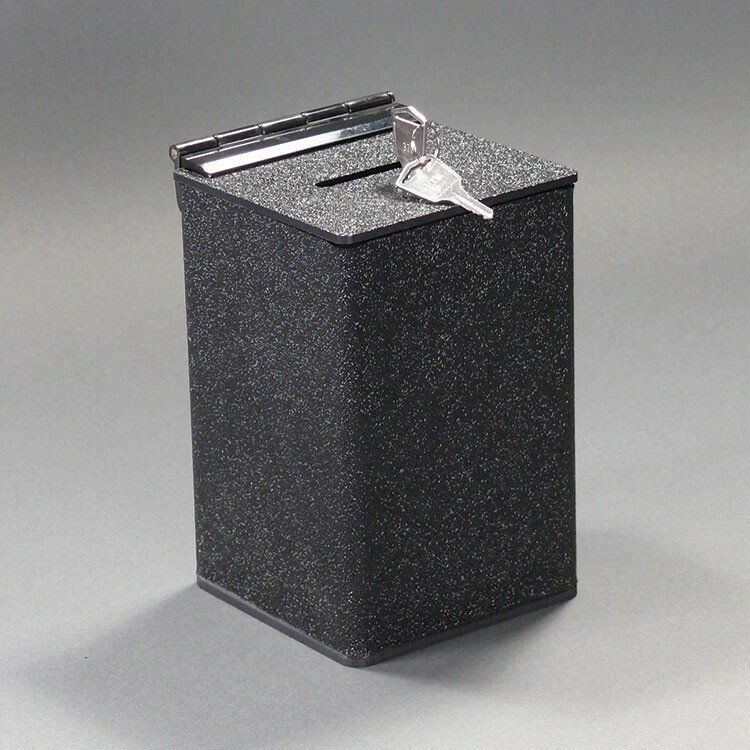 This lockable entry box has hinged top covers and key locks for added security. Backs have four holes for mounting into wall. 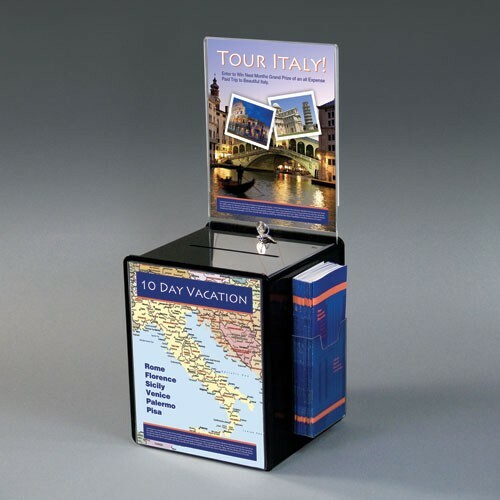 Inside Dimensions: 12"w x 13 1/8"h x 4-1/2"d , Outside Dimensions 13"w x 17"h x 5"d. Top slot size 7"w x 1/4"d, Comes complete with a brochure dispenser that fits 4" x 9" literature and a 8 1/2" x 11" sign holder.